The Innsbruckring climb shattered the group in Stage Two of the women’s KISS Super League, leaving just a handful of riders to battle for the win. One of them got the chance to retry a sprint finish that went wrong in Innsbruck last year. “The Leg Snapper” kicker cuts the bunch in half twice! Missed this week’s race? Watch it below, read the recap and check the results. As expected, nearly all the action took place on that leg-snapping climb. The first time up shrank the peloton to half its size! The selection of the race was made on the second lap. Mary Wilkinson (Zwift Academy Dream Team) attacked up the steep slope with a feather PowerUp. Cassie Baldi (Zwift All Stars) was the first to catch her. Several others managed to bridge, but the line of riders stretched and gaps began to grow. 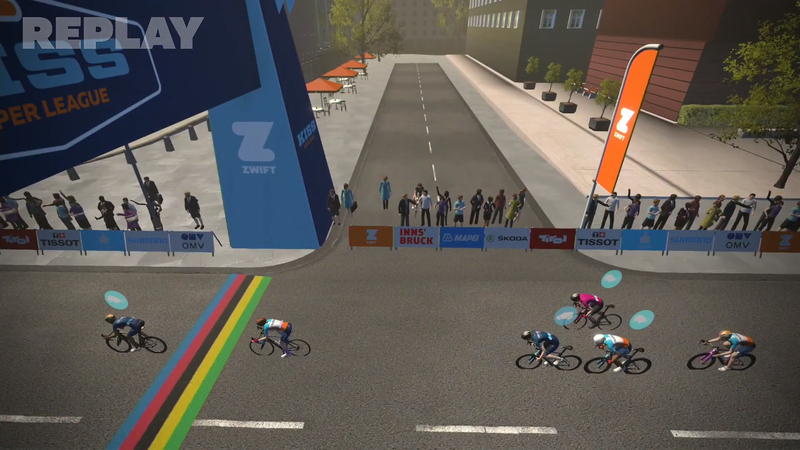 Just 8 riders remained up front after the hill – 3 from Sho-Air Twenty20, 3 from Zwift All Stars, and 2 from Zwift Academy Dream Team. The closest chase group had 5 riders, who were about 15 seconds behind at the intermediate sprint point. The leaders worked to distance the chasers on the flat section in the third lap. Meanwhile, the chasing group wasn’t ready to give up yet. 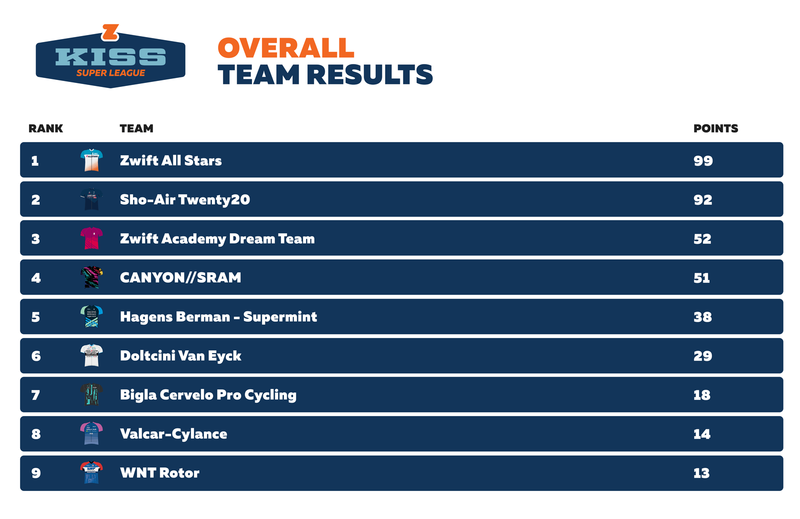 Ella Harris (Canyon//SRAM), Liza Rachetto (Hagens Berman – Supermint), Nicole Hanselmann (Bigla), and Marion Sicot (Doltcini Van Eyck) did not have teammates at the front. They wanted back in. The gap was 30 seconds at the start/finish line, and it only grew to 38 seconds by the base of the third climb. Amanda Coker and Erica Clevenger from Sho-Air Twenty20 led the charge up the hill on lap three, with Baldi taking over near the top. The lead group stayed together this time. But the chase group was now more than a minute behind, and they had lost Hanselmann. They couldn’t make it back, but they could still earn points for their teams. The fourth lap had a calmer start. The racers were preparing for the final challenge ahead. As soon as they hit the base of the last “Leg Snapper” ascent, the leaders shot off like firecrackers! 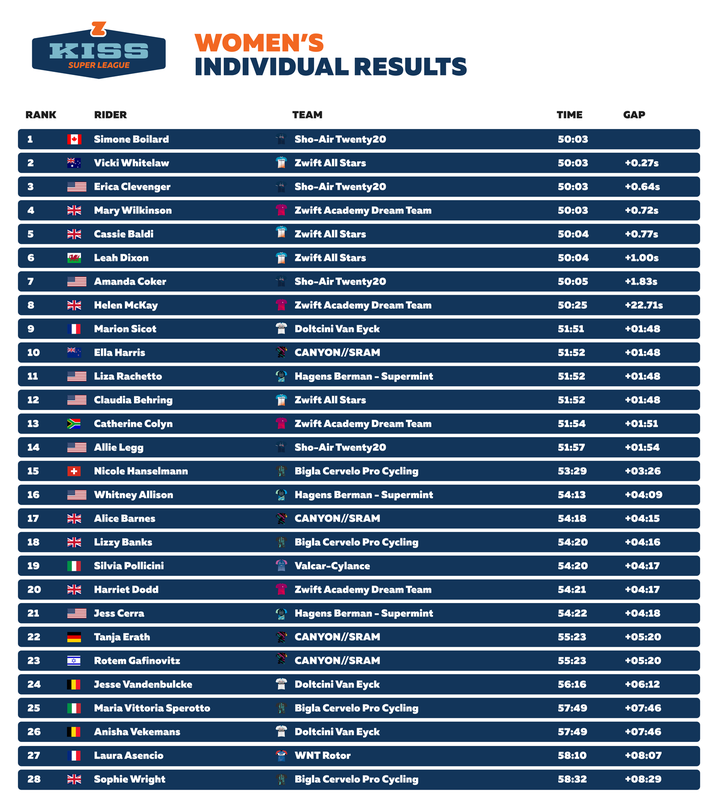 Helen McKay (Zwift Academy Dream Team) was getting dropped. When the others saw this, they kept up the pressure over the top of the hill, not giving her any chance of getting back. They rolled through the last sprint banner at a steady, high pace. The stage was going to come down to a 7-woman sprint. Coker set a high pace at the front of the group. She seemed to be fending off late attacks, which would help a teammate with a winning kick. 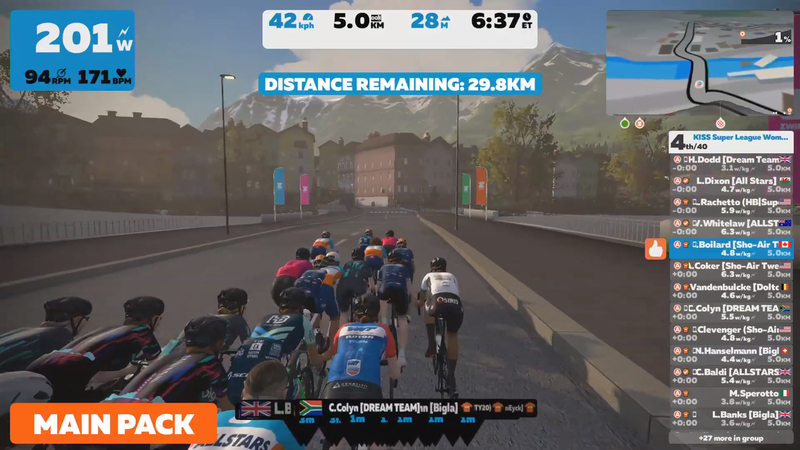 Leah Dixon (Zwift All Stars) was the first to make a move. Simone Boilard (Sho-Air Twenty20) followed immediately with a huge burst of power and an aero helmet PowerUp. 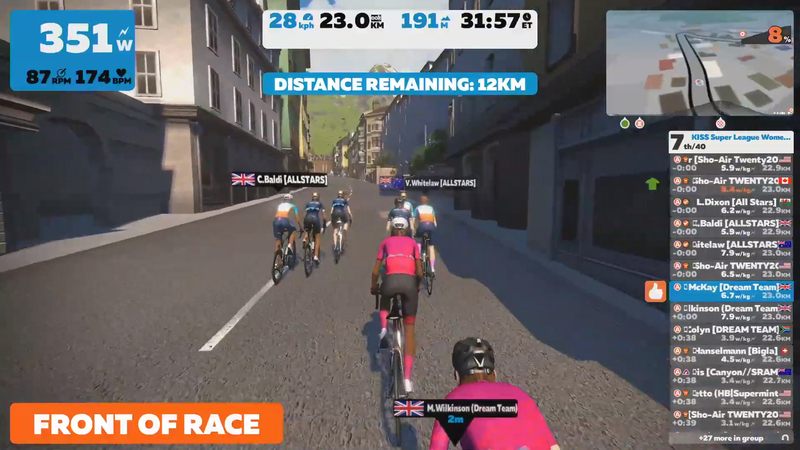 Vicki Whitelaw (Zwift All Stars) just reached her wheel, but she could not get around before the finish line. Boilard took the victory, and Sho-Air Twenty20 took two spots on the podium. She said Sho-Air Twenty-20 had a plan to stay in front and be prepared to give an all-out effort on the steep climb every lap. It worked well, with Sho-Air placing three riders in the lead group. 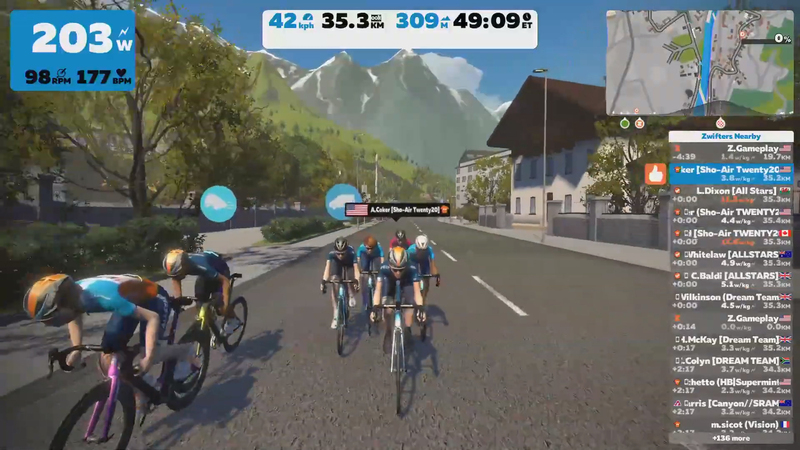 Baldi said the Zwift All Stars also focused on staying in the front of the group on the climbs. They are still in the lead of the team competition, but Sho-Air Twenty20 is in a close second. The intermediate sprint competition was back this week. Riders who crossed the line in the first few positions each lap earned points toward this goal. Impressively, Boilard won this too! Coker, her teammate, provided her leadout for the sprints and even managed to claim a few points for herself. Tune in live next Tuesday to catch the action! Men’s KISS Super League: Every Wednesday at 11 am PST. From Jan 23rd to Mar 27th. Women’s KISS Super League: Every Tuesday at 11 am PST. From Feb 19th to Apr 9th.